The first private sector milk factory was established. The first production of processed cheese and cocao flavoured milk started in Turkey. Pınar Sliced Kashkaval and Cream Cheese were introduced to the appreciation of consumers. The publication Pınar Newspaper addressing milk producers was launched. Pınar and Kraft collaborated and the production of Pınar Deram, Raglet, Maribo ve Cheddar was launched. Pınar established under the leadership of Tütünbank, joined Yaşar Group. Pınar formed sales team for Istanbul and organized an event for distributors in Cesme. Pınar Dairy Primary School Students Art Contest was held. Milk, cheese, butter, yoghurt and strawberry flavoured milk were first exported to Central Europe, Middle Eastern countries and TRNC. Pınar Yem was established in order to meet the need of quality animal feed of the milk producers from whom Pınar Süt collects milk. Pınar Yem, one of the most important links of the agriculture oriented industry, carries out its activities under the name of Çamlı Yem Besicilik led by the mission of “being reliable, innovative and pioneer”. Yaşar Pazarlama Dağıtım A.Ş. was established. The production of mayonnaise, salad dressings along with Krem Beyaz, Pınar Beyaz and Krem şanti, which is one of the powder products, was launched. Pınar Su plant, bottling the first packed water of Turkey was launched in İzmir Menderes. The (first) drinking water in non-disposable packages ... Pınar Şaşal. The production of Labahne, honey and jam was started. The warehouses in İstanbul Ayazağa and Küçükyalı started their activities. Pınar labne, milk, ayran,butter,yoghurt,cheese, whipped cream, mayonnaise were started to be exported to Kuwait,Cyprus and West Germany. Turkey’s first modern integrated meat plant “Pınar Et” was established. Meats obtained from slaughters carried out in hygenic environments and delicatessen products like garlic sausage, salami and sausages packed without touching were best appreciated by consumers. Pınar Şaşal was exported for the first time to Germany. Turkey’s first fish culturing farm was established by Pınar. Sea bass and gilt head bream and sea foods were started to be produced. The production of ketchup, the black mulberry juice and lemonade were started. North American style of outdoor cropping livestock farming started with the establishment of Çamlı Besicilik company for the first time in Turkey. The same company served Pınar Et. Pınar Yem started the production of fishmeal. Turkey’s first meatballs for hamburgers were produced by the collaboration of Pınar Et and McDonalds. Pınar Et inroduced frozen ready-food to the Turkish market. Dairy products, cheese, sweet sauces and syrups for McDonald’s were produced. Pınar Deniz started the exportation of fry, frozen sea food and fresh fish. Pınar Süt Children Theater was established. Birmaş Markets were established in order to ensure the sales of carcass meats butchered by Pınar Et. Pınar dairy’s innovative products like sahlep and cacao puding were introduced to the market in Tetrapak packs. Central and North European, Middle Eastern, Far Eastern countries and TRNC do not give up the taste of Pınar Su . %90 of Turkey’s total amount of drinking water exports are realised by Pınar Su. First low fat milk Form Süt and Çikolasüt, produced from real chocolate, were introduced to the market in Turkey. Pınar Yoghurt was awarded the Golden Package Award of TSE for the use of a folio cover applied for the first time in Turkey. Pınar Süt was awarded with the “Environment License and Medal” given by the Ministry of Environment for its efforts in protecting and improving the environment, preventing pollution and creating the awareness for environment. Pınar Süt was the first company that received the “TS ISO 9002 Quality Assurance Certificate”. The Consumer Hotline, 0 800 41 55 117 serviced free of charge, was set up in order to respond to the advices and opinions of the consumers. Pınar Süt was awarded the Golden Package of TSE for its 10-liter kutupak package. Pınar Süt became the first milk company that was granted the TS ISO 9001 certificate for it has proved to be compatible with the European Standards in terms of its production, sales and after sales services. Pınar Et became the first meat company that obtained the TS ISO 9002 Quality System Certificate. Production of long-life fruit yoghurt and packaged desserts were launched. Pınar Et started production of frozen ready meals. Turkish consumers were introduced light, extra light yoghurt and light triangle cheese. The second plant of Pınar Su was given into service in Aydın Nazilli and Pınar Madran Su, considered to be the most delicious waters of the world, was presented to the appreciation of the consumers. The production of white cheese, İzmir Tulumu, fruit juices in slim packages and rolled butter were launched. Rolled butter was awarded with TSE’s “Golden Package” award. Pınar Food Servis and Birser was established to serve mass consumption areas. The Pınar Süt Eskişehir plant, contributing to the development of livestock industry in Inner Western Anatolia was launched. Pınar Kido Çocuk Tiyatrosu started its activities in İstanbul. Kido Süt family was introduced to the market. The production of Beyaz Peynir, Koyun Peyniri, Top Mozarella, Rende Peyniri, Camembert Keçi Peyniri was launched. The publication of the magazines Pınarca and Pınar Servis were started. Pınar Yem was the first Turkish company exporting shrimp baits. Pınar, opened Turkey’s first fully integrated turkey plant and inroduced white turkey meat to Turkey as a new type of food. Çamlı Damızlık Hindi Üretimi AŞ was established and stud turkey eggs were produced for the first time in Turkey. Functional milk (milk without lactose, and milk with calcium and vitamins A,D,E) products were introduced to the market. Pınar’s logo and values were revised and it’s new logo was launched. An investment was made in Eskişehir for the continuous production of Creamy Yoghurt for the first time in the world and in Turkey. Çamlı Yem was the first plant which started to use the extruder technology in the production of fish bait in Turkey. A new brand name, Bio Aqua Balık Yemleri, was started to be used . Sliced delicatessen products were produced under modern and hygene conditions in an untouched way by Pınar Et for the first time. UHT milk , kaymaklı yoğurt, Pınar Kido Mini Peynir with a practical cover were awarded with the TSE Golden Package award. 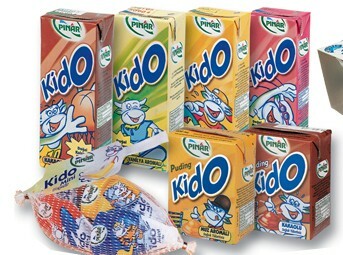 Pınar was prized with the World Package Award for its Kido Mini Peynir product. Pınar Su obtained the TSE ISO 14001 Environment Management System Certificate. Pınar Et produced traditional Turkish Doner in an industrialized way with its same taste and introduced it to the Turkish market. Pınar Et produced frozen sea foods. Pınar Süt Eskişehir plant received TİDEB R&D incentive of TÜBİTAK for its investment of creamy yoghurt and bottle milk. Pınar Yem’s name was changed to Çamlı Yem AŞ and awarded for providing highest number of employment amoung all the bait producing companies. Turkey’s first integrated Organic Fertilizer Production plant was established and the brand Bio Farm was born. Pınar started the production of milk bottled in plastic bottles based on UHT technology which doesn’t require a second heating. Çamlı Yem ve Çamlı Besicilik merged and adopted the name of Çamlı Yem Besicilik AŞ. Pınar Süt won the Quality Prize of the Aegean Region. National Productivity Center awarded Pınar Süt with the Employer of the Year. Pınar Entegre Et plant, audited by EFSIS, the most experienced and independent supervisory board of the food industry, which carried out the audits of world-wide supplieres in the name of McDonald’s during the years 2002-2003 and 2004 obtained “the highest mark”. Pınar Madran carboy of 19 lt. was introduced to the Aegean Region market. Marmara Su AŞ was established upon the acquisition of two springs in Adapazarı and Isparta. Pınar Yaşam Pınarım and Pınar Denge waters were launched. The 19l carboy was presented to the appreciation of the consumers. Yoplait Meyveli Yoğurt was presented to the appreciation of the consumers after the agreement signed with Sodial. Pınar Sea Foods was integrated with Çamlı Yem Besicilik AŞ continuing its agricultural activities. The certificate of TSISO 14001 Environment Management System was given to the factories in İzmir and Eskişehir of Pınar Süt. Pınar Et passed to the certificate of TS ISO 9001-2000. Pınar Su passed to the certificate of TS ISO 9001-2000. Pınar Et changed its HACCP Food Safety System in use since 1994, into TSE13001 HACCP Food Safety System Certificate. Nine assortments of meatballs were introduced to the Turkish consumers under the concept “Turkey’s Meatballs”. Pınar Swiss, genuine Swiss chocolate, and Danish cookies Pınar Canım Çekti were introduced to the market. Pınar Kafela, Karamela and Çikola Süt were introduced to the market in special packages for teenagers under the concept of "Zevkli Sütler" . Prepared frozen fish products and packaged fish meals were introduced to the market. Çamlı Yem Besicilik became one of the companies with the widest product range in Turkey. The website www.pinarmutfagi.com was launched. For the first time in Turkey and in the world, a food company broadcasted its entire production process live through cameras over the internet for 7 days 24 hours. Pınar Süt was given the TS 13001 HACCP Food Safety System Certificate. Pınar Et was given the TS ISO 14001 Environment Management System certicate. In 2004, the products Yoplait and Kafela were awarded with the Golden Package Prize by TSE. In 2004, the web site www.pinarmutfagi.com ranked first in the competition “Altın Örümcek Web” in the food and beverage industry category. In 2004, the company was awarded with the Consumer Quality Prize in the category of meat, milk and water and in 2005, it was awarded with in the category of meat and milk. Turkey's first organic milk was introduced to the consumers under the name “Pınar Organik Süt”. Turkey's first prebiotic/probiotic products like “Pınar Prebiyotik Süt” and “Pınar Prebiyotik/Probiyotik Light Yoğurt” were introduced to consumers. The TS 13001 HACCP Food Safety System Certificate was given to Pınar Su. HACCP practices were included within the framework of the ISO 22000 Food Safety and Management System. Yaşar Holding signed the United Nations Global Compact based on voluntariness. Pınar brand joined the Turquality project which was developed with the purpose of Turkish products of high quality being introduced to the world market and the image of Turkish products being established in the world by the Undersecretariat of Foreign Trade, the Turkish Exporters Assembly and the Exporters’ Association. Pınar Meat became the first company in its sector to be granted the TSE 18001 OHSAS Occupational Health and Safety Certificate. The launching of Pınar Çocuk Milk took place in order to meet the need for vitamins and minerals of children aged 1-3 and for them to develop in a healthy manner. Refreshing fruit juices “Limonata” and “Tropik” were introduced to the consumers. New facillities of Pınar Süt Eskişehir plant were launvhed on 09.10.2010. Promotion of Pınar Organic Yoghurt to our consumers. Pınar Water was offered for sale in Glass Bottles and Glass Carboys with a seasonal concept. Pınar Fruit Juice family was expanded with new varieties. Pınar White with Chocolate and Pınar Clotted Cream came together with the consumer. Gourmet Salami joined Pınar Meat family. The varieties of Pınar Square Turkish Dumplings and Pınar Kayseri Turkish Dumplings were introduced to the market. Pınar Water brought together its new product Mineral Water with the consumer. Kadınbudu Köfte (Meatball) and Mini Pizza were released to the market. On 12.05.2013 the foundation of the Pınar Milk Şanlıurfa Factory was laid. Pınar Turkish Cheese Lasagna was offered to the consumer. Pınar Large Slice Soudjouk was introduced to the market. Pınar Gourmet Slice Salami family was offered for sale. Pınar Strained Yoghurt were offered to consumers. Pınar Pink, fruit juice specific for only women, was introduced to the market. Pınar Enjoyment Cheese family was introduced on the market. The 33rd Pınar Painting Contest received an award at the Felis awards in the “Brand Voice” branch. Pınar Cocoa Sauce was offered to the consumer. Pınar Denge Lactose Free Yoghurt was released to the market. Pınar Organic Daily Milk was introduced to the consumer. Pınar Double Cream White Cheese was offered on the market. Şanlıurfa Pınar Milk Factory was opened. With the Pınar Children’s Theater continuing for 28 years, Pınar won the Silver Stevie Award in the category of ‘Corporate Social Responsibility Program of the Year in Europe’. With the Pınar Painting Contest that was held for the 34th time this year, Pınar received the Bronze Stevie Award in the category of ‘Communication Campaign of the Year – Media Relations’.